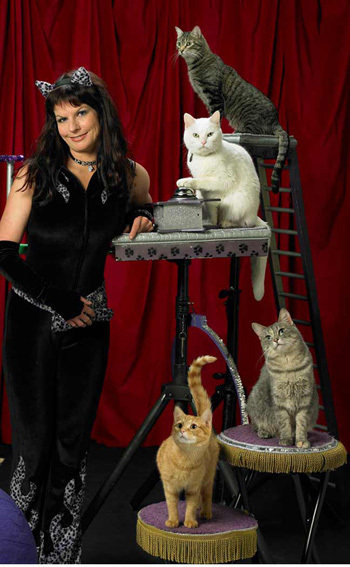 The Amazing Acro-Cats will perform their Remarkable feats of agility (remarkable because they’re …you know…house cats) pushing carts, riding skateboards, rolling barrels, ringing bells, turning on lights, walking tight ropes, jumping through hoops, and much more! The all cat combo, “The Rock-Cats” have grown in size, style and diversity! We have two new band members! In addition to Pinky on guitar, Dakota on drums and Nue on keyboards, Hen-diana Jones, who happens to be a chicken, can really peck a tambourine. Band manager, Tuna decided that every song needs more cowbell so instead of just a jazz ensemble these cats are now into Latin grooves and have an island rhythm section! Under the careful direction of master trainer Samantha Martin, the performance offers a unique blend of spectacle, entertainment, education and public awareness. As a pioneering feline behavioral expert, Martin has devoted her life to animal welfare and public education helping people better understand their animal counterparts. Our 55 most recent $55 donors. Space 55 relies on donations to fund its season. Please click below to help Space 55 continue. © 2010 - 2019 Space 55. All rights reserved.